East Memphis is about to get a little cheesier — but in the best of ways. “We are trying to bring the Midtown food scene out East,” Adams said. Adams, of Adams Restaurant Services LLC, also owns Dan McGuinness, TJ Mulligan’s and Last Burger on Earth (LBOE). Graham Reese Design Group is handling the interior on Mac’s, and Brett Wyatt Construction is in charge of building. Adams did not want to give an exact figure but said renovation costs are around $300,000-$500,000. Part of that renovation is for wooden garage doors that will allow the outdoor patio seating to flow into the restaurant. In total there should be dining space for around 140 customers. Mac’s menu items will range from $5.95-$12.95, and 10-12 draft beers will be available, with a focus on local brews. However, if you’d like to watch a game, Mac’s will have that covered. The restaurant plans to mount TVs throughout the space with the option for a larger projection screen that can come down in front of the bar. For all the loyal Dan McGuinness patrons, don’t worry. Now located next door at 4694 Spottswood, the Irish pub trimmed down to accommodate its 4,200-square-foot Mac’s neighbor, but all the pool tables and games are still there. Customers who want to order food at McGuinness will be handed a Mac’s menu, and the food will be brought to them. 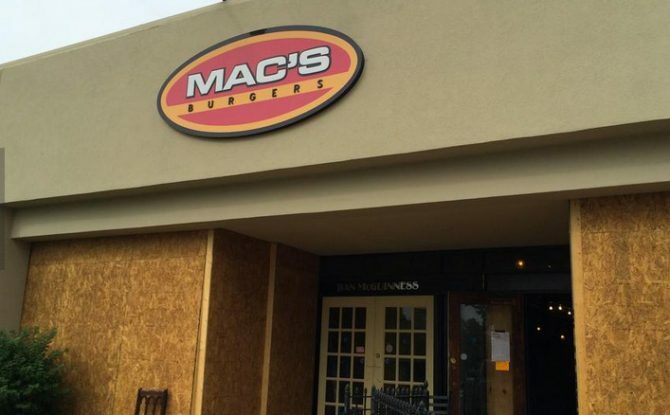 Mac’s will be open seven days a week from 11 a.m. to 11 p.m. Adams says people at McGuinness after the Mac’s kitchen closes are welcome to order takeout from any restaurant in the area and have it delivered. Construction on Mac’s should wrap up the end of May, with a projected opening date for mid-June.